What little boy doesn't love toys? 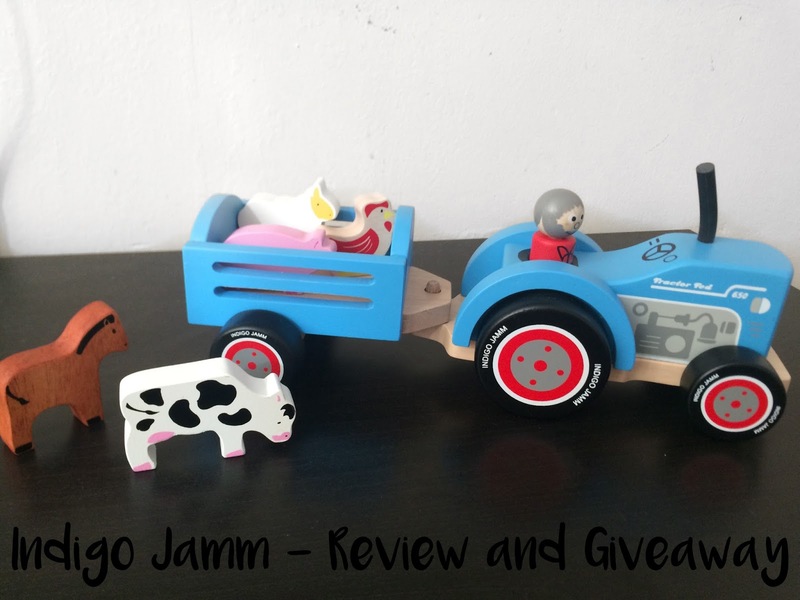 And what Mummy doesn't love wooden toys, (well certainly not this one) So when we were contacting by the fantastic Indigo Jamm to pick something from their website to review, I was very exciting, even more so when they said I could give the exact same toy away to you guys - yay! Like most children his age, Noah is into phases and his current phase is definitely Tractors and Buses. So when I saw their amazing blue Tractor and Trailer, I had to choose just that. I was so surprised first of all when it arrived and we began to unbox it, that everything was neatly wrapped in tissue within the box, which is SO refreshing as I can't tell you how much of my time has been wasted fighting with sharp plastic packaging just to get to a toy for an impatient toddler. It seems like Indigo Jamm had read my mind though as there was no such thing, and within seconds I could discover the beautiful wooden tractor. I was thrilled to see it was just as vibrant and striking as it appeared on their website, and it was hands down one of the best quality wooden toys we've owned, and as I'm raising a toddler, we own a fair amount. As you can imagine it has been firmly glued to Noahs hand, and although we managed to distract him, there was very nearly some tears when he found out he couldn't take it to bed. I'm fairly confident if I'd have let him, he would have stayed up till all hours racing it around his room. The last thing he said as I kissed his forehead goodnight was 'Noah can play with the blue tractor tomorrow', and that's how I know it was a wise choice. I've already saved a few selections for Christmas and his birthday coming up, as I know by the Tractor that these toys will last a lifetime, so P will definitely get some play out of them too as he grows up. Now too the exciting part, Indigo Jamm generously gave us another Tractor to giveaway to you guys, all you have to do is make sure you're following me on Twitter here and leave me a comment below letting me know what you're little ones favourite toy is, or even yours as a child? Winner will be picked 1 week today, and announced at 6pm on Twitter. This is so cute! Elodie absolutely loves a jellycat ball we have that makes a lovely 'boing' noise every single time it moves! But my little brother, who is 3 is completely obsessed with tractors and diggers!! He would LOVE this! My daughters favourite toy is her dolls house, which she started playing with in a local charity shop. It cost me just £7 and she has had hours and hours of fun already. It means I get time to hoover, mop and wash the dishes too while she plays! Love a bargain! Wooden toys of any description were my favourite (& still are). Thomas and Friends Trackmaster Sets are the little ones favourites! One of my favourite toys as a child was a blackboard and easel made for me by my Dad. I would love to win this for my Grandson, Samuel. she has a giraffe that she takes everywhere!! As a child it was my Tiny Tears doll, had it for years. Maxs favourite toy is anything with wheels, trains, tractors, cars. I loved sylvanian families!! All mine loved their Lego, played for hours. My sons loves his animals toys most of all, he loves to set up a zoo! My youngest is just getting into tractors, all his older brothers tractors are now being driven all over my kitchen and up the stairs! My big girls favourite toy is her duplo at the moment!! Amazing give away, perfect for my son's nursery. Love wooden toys, my son absolutely loves his wooden track and trains. Her favorite toy changes quite often. Right now, it seems to be my loom band and hama beads, along with her paints. I grew up in the Rubix Cube era, so there were plenty of similar puzzle games to keep me engaged. My son loves his iggle piggle singing toy. He's 15 months and dances with it. This is super cute, my two love their cars! My daughter loves her Fisher Price Princess Stroller! Her "baby" doll at the moment! my sons favourite thing to play with at the moment, is his cars on his road play mat. What Is The Right Age Gap?